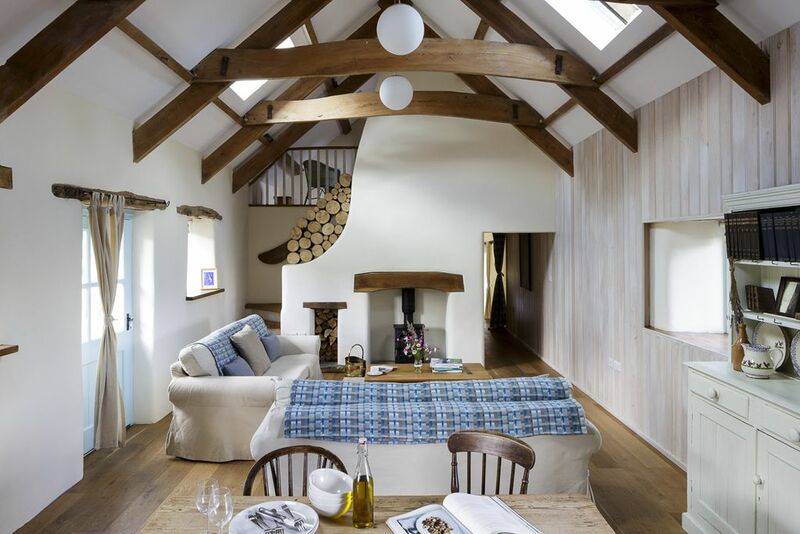 A lovingly converted eco barn overlooking a wildflower valley in arty Pembs. For honeymoons and mini moons... a slice of heaven! If you have any questions or want to enquire about dates, use our form to contact Daniel & Jemma Slade-Davies or see their website for more information. Solar panels, biomass boiler, wood-burner, Welsh wool… You’re as snug as a bug and surrounded by wildlife, yet only five minutes from Newport. Down a pot-holed track on a hillside, overlooking the lush valley, is this big lovely bolthole for two. Jemma (jeweller) and Daniel (cellist) have happily returned to the family home to raise their young family and are full of exciting plans, eg. vintage weddings and civil ceremonies in the barn. (Don’t worry: all self-catered stays are wedding-free!). The setting is idyllic and the garden has a view-filled terrace, picnic table and fire pit, raised beds and a beautiful wild flower meadow. Inside are two levels of heated wood floors (sanded planks up, new oak down) linked by a small curving stair. The open-plan sitting/dining/kitchen space is downstairs, the wet room too, and the bedroom is up: goose down bedding, a claw-foot tub, space for an extra bed. Discover Europe’s smallest city, St David’s, or explore friendly little Newport. You can walk to the pub. Special offer: LASTMINUTE Stays (arriving in 14days) get 25% off. Minimum stay: 2 nights. 2 nights on weekdays. 2 nights at weekends. 2 nights in high season. Short breaks available. Pets by arrangement. Welcome breakfast pack. Additional organic food can be ordered. Restaurants 2.5 miles away. Extra bed/sofabed available £80 per person per week. We can’t thank you enough for making our holiday & wedding so perfect. The cottage is breathtakingly beautiful - spotlessly clean and so homely. The moment we were greeted by Daniel, Elsbeth & Henry picking blackberries we knew we’d found a home from home. It couldn’t have been more perfect; thank you so much for the hand picked flowers; and send Amy our sincerest thanks for helping me into my dress! You have been so helpful and welcoming. It will forever be in our hearts; and we will return! We enjoyed such a relaxing stay even with the rain! This is a special place and we hope to be back soon. Wow! What a wonderful time we’ve both had at Nantwen. It has been as special as we could have hoped. Daniel and Jemma, thank you so much for all of your help. We could not have enjoyed a more special wedding. Nantwen really has provided a magical backdrop. Nantwen is now etched onto our hearts….and of course, also now our wedding rings. We have had a wonderful week at Nantwen. Peace & Dramatic scenery. Coastal and Country walks are superb, loved Porthgain and Pentre Ifan. We know perfect weather helped, but we know the house and region would be just as lovely at any time. We slept soundly in the superbly comfortable bed and awoke to birdsong and sunshine every morning. Our second visit to Nantwen and as enchanting as before. The facilities are first class and felt so relaxed. A resident family of swifts greeted us each morning as we sat out with our breakfast and Parsnip the cat gave us a friendly welcome. Daniel and Jemma look after you well and it really is a special place to stay. We planned our runaway wedding at Nantwen. Nantwen is such a beautiful place. And we were made to feel so welcome. The grounds around Nantwen are beautiful and the photos were perfect. Our one year old little boy loved running around the grounds. Home from home. We will definitely be returning next year for our anniversary. A beautiful place for a small wedding. Jemma and Daniel were excellent hosts. The cottage is lovely with everything you could need for a romantic break. Set in the beautiful Pembrokeshire countryside near the beach and restaurants/ pubs of Newport this is a great location. We had a very nice stay at Nantwen. The cottage is warm, nicely decorated and well equipped. Good local walks and Newport is a charming village with good restaurants and food shops if you feel like staying in. Wonderful setting of lovingly restored cottage with perfect wildflower meadow and garden. Quiet. Secluded. Great log fire, shower and well equipped kitchen. So good we even got engaged! Nantwen is just beautiful, so peaceful and cosy. Highly recommended to everyone who wants luxury whilst being far from the madding crowd. A fantastic and peaceful place to stay. Beautifully appointed accommodation. Fantastic friendly but not intrusive hosts. Brilliant base for exploring the Pembrokeshire area. Lovely venue for our wedding. Whole family was very helpful and we really enjoyed our stay. Thank you. We had everything we needed at Nantwen including a really warm welcome from Daniel & Jemma. The location is perfect and the house warm and comfortable. The night sky took our breath away, we've never seen so many stars! Nantwen is a fabulous secret. Secluded and romantic. We had a perfect wedding and loved every minute. It is truly, a very special place. Wonderful location. Quiet. Stunning building. Bath in the bedroom a real luxury. Kitchen well stocked. Friendly host. My wife and I thoroughly enjoyed our recent stay. It is a wonderful bolt hole nestled in the idyllic Welsh countryside. A delicious welcome pack was provided and everything was just as you might want. A perfect weekend of walks, red wine and lazing on the sofa - if you need to get away from the grind and fancy shutting off from the world for a while then this is the place (although we did catch up on a box set when it was raining - thank you Netflix). luxurious space for two in a quiet setting. A home from home built by local craftsmen. Breathtaking wooden features and real attention to detail. In the Pembrokeshire Coast National Park. Walk from the door in ancient woodland, or the Coast at near by Newport. Guests to Nantwen are given freshly baked bread, milk and butter as well as a delicious welcome hamper. Further food including cakes and afternoon tea can also be ordered. See our website for more information. Bake in the well equipped kitchen or prepare a romantic evening meal to enjoy around the rustic table before curling up with a book or watch a DVD from a vast selection in the snug. Neal's Yard products to enjoy in our deep claw foot bath. If you are an amateur musician and are looking for a course for yourself or with friends then visit our website for information about our string instrument or chamber music courses. You can get married here too! Nantwen is licensed for civil ceremonies. Take a boat ride to Skomer, Visit Narberth or St David's, watch the dolphins in Cardigan Bay. Amble through the village of Newport with its Small shops and galleries before stopping for a delicious meal in one of the five restaurants. Daniel, who grew up here, is a professional cellist who arranges master classes each summer that culminate in a concert in their own music hall. Jemma is a goldsmith and they live here with their young children, Taran the old horse and a huge white cat called Parsnip (who prefers men).